A Boynton Beach police officer may never see the inside of a prison cell after a judge cleared the officer of part of his conviction. 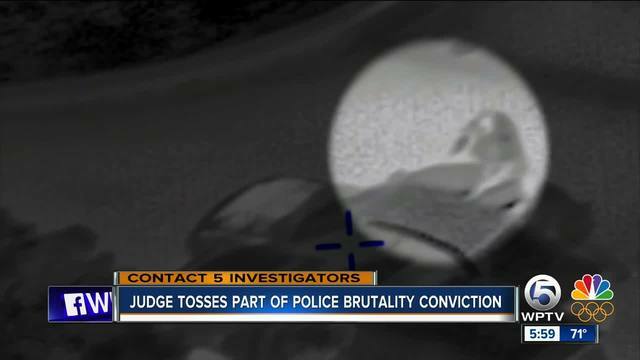 In November, Officer Mike Brown was convicted of excessive force resulting in bodily injury and using a firearm to commit a violent crime for his part in a 2014 police brutality case that was captured on helicopter video , made international headlines and cost the city of Boynton Beach $600,000 in settlement fees. "Anytime something like that happens, it is big. But when you have a police officer charged with doing something violent in the course of his job, it’s tremendous." said legal expert and defense attorney Michael Salnick, who does not represent Brown or any of the officers who were charged alongside him. Despite a jury's conviction, Contact 5 Investigator Merris Badcock confirmed U.S. District Court Judge Robin Rosenberg granted Brown’s motion for acquittal on the firearm charge, a crime which could have gotten Brown a mandatory minimum sentence of five years in prison. "I have had client who have been acquitted, but they live with the accusation forever. ‘Hey, you’re the person that did this. You’re the person that did this.’ When you get accused of something, that creates such a tint on an individual that sometimes they can’t overcome it," Salnick said. According to Rosenberg’s ruling, this is about following the law. While Brown was convicted of causing bodily injury to an unarmed man, bodily injury is not considered a violent crime. Since bodily injury is not a violent crime, Brown cannot be convicted of using a firearm to commit a violent crime. "Brown did not get off because he was a cop," Salnick was quick to point out. "He got off because the law was not followed, because federal law was insufficient, and a judge understood that. It take a lot of courage to look at the law and understand if the law does not define something properly, you always have to construe it in favor of the accused." Brown still faces up to 10 years in prison for the excessive force charge, but since there is no mandatory minimum for the crime, there is a chance Brown could only be fined. "I would want Michael Brown backing me up if I was a police officer. I would want someone like him to be able to take care of a situation," said Salnick. "There is such a cry in this country to blame police officers for doing violent things to people, and I think a lot of times that is a cheap shot. Cops get the brunt of that." On Friday, after Rosenberg's ruling, Brown's defense attorney withdrew his request for a new trial. Brown and his defense team are expected back in trial next month for a pre-sentencing hearing. Follow WPTV’s Merris Badcock on Twitter for updates on this case as it develops.